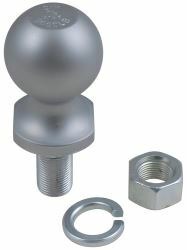 A trailer hitch ball is bolted to your hitch's ball mount and provides the attachment point for your trailer's coupler. The ball allows the trailer to pivot to provide smooth turning while towing. 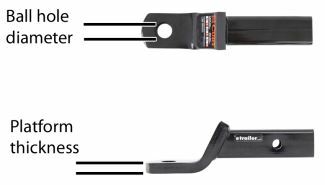 Trailer hitch balls are sold in various shank lengths and diameters, ball diameters and weight capacities to meet your towing needs. To choose the right hitch ball for your application, you need to know a few things about the trailer that you tow and your ball mount. 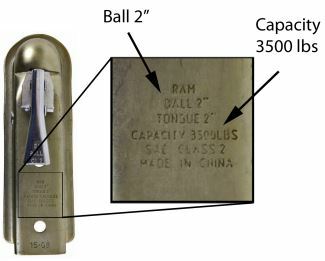 Most trailers list hitch ball size (diameter) and maximum towing capacity on the tongue, coupler, or frame. 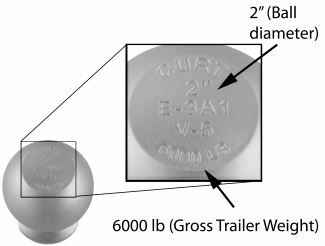 Any hitch ball used to tow the trailer should have the same diameter and a maximum capacity the same or greater than that listed. 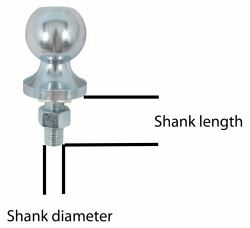 Common hitch ball diameters are: 1-7/8", 2", and 2-5/16". Ball mounts vary in the thickness of the platform and the diameter of the hole. To fit different ball mounts, balls are available in a variety of shank lengths and diameters. Ball mounts do not usually list these 2 values, so you will have to measure. Common diameters are 3/4", 1", and 1-1/4", but there are a few balls available in several less common sizes. Once you know the diameter of the mounting hole in the ball mount, choose a ball shank diameter of the same size. Hint: When choosing shank length, consider that the shank must not only pass through the ball mount, but it will have a lock washer and nut on the end. To ensure safety, the shank should extend past the nut by at least 1 thread. Shank diameter: 3/4" and 1"
Shank diameter: 3/4", 1" and 1-1/4"
Shank diameter: 1" and 1-1/4"
Hitch balls are made of several different materials and finishes, each with its own advantages and disadvantages. Some balls are made with a built-in rise that positions the ball slightly above the ball mount when the ball is installed. This rise can provide a way for you to gain height to tow a trailer that has a higher coupler. 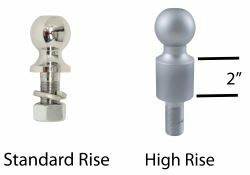 High rise balls typically add 1" or 2" of extra height.